Are Oscilloscope Software Upgrades Worth It? « Adafruit Industries – Makers, hackers, artists, designers and engineers! 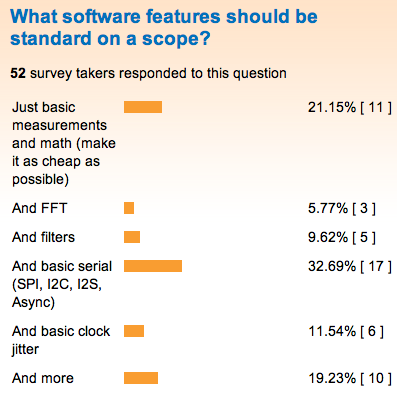 Are Oscilloscope Software Upgrades Worth It? You know what? I can buy an entire oscilloscope (USB module or standalone) — one that includes serial decodes and FFT — for less than the cost of one of those software options on many higher-end units! Does that seem reasonable? I’m sorry, but FFT just isn’t that big a deal any more. Free code has been floating about for decades, and it isn’t suddenly worth $1,000, just because it’s running on a scope. That just makes customers feel taken advantage of. Similar story for simple serial decodes. I won’t repeat myself. Is there a downside to my feature comforts? Well, some pretty sophisticated entry-level scopes are now available at nice price points. You can probably end up doubling their cost by loading up on features. Would making more of those features standard raise the price of entry? Maybe. But, as I implied above, getting a second, lower-end scope with those features as standard would give you two scopes for less than the price of one. Personally, I’m inclined to agree with him, especially about the serial options. Many of the serial options mentioned in the poll are native to $2 microcontrollers, and none are particularly fast (except I2S, sometimes), so why do the software-only upgrades cost so much? I have a program that reads edges on the ICP pins on the Mega (4 and 5, add 1 and 3 on the Seeeduino mega). The FTDI can do 2 megabaud, so I can just print microsecond intervals (or finer). I2C wouldn’t be a problem,I usually use it for baud-shifti g UART protocols, or raw J1850, or similar pwm stuff. Scopes are cheap. I’m looking at an OWON with 10M sample memory so I can get detail when I zoom. Saelig has it plus battery for around $500. It has FFT and measurements. “Golden Screwdriver” software upgrades aren’t worth it. They should just opensource. It or have an API. No argument from me. I don’t mind paying an appropriate price for professional tools, and I think there’s a place for mid to high range equipment, but $500-$1K just for something like an I2C/SPI decoder is utter nonsense. Obviously this works economically for Agilent and Tek, but I’m convinced it’s because a lot of those purchases are on the company dime and particularly in bigger companies, it’s not really anyone’s money to the engineers just fill out the purchase order and forget about it. For a smaller company, though, where the money is directly connected to your own profit or paycheque, it’s definately frustrating to do the math. Alas … if you want to do your job properly, you need the right equipment to di it reliably … but I’d happily buy a much more Flexible Saleae logic than any ridiculously over-priced analyser for my Agilent scope at 5x the cost. Exporting data in fast mode, is definitely the key feature that I am expecting. DSP can be nicely, quickly done on remote devices (including Arduino or so! ).